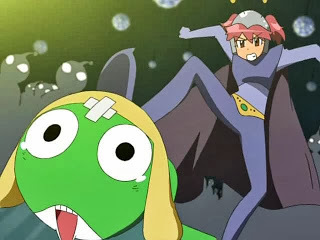 Fuyuki and Natsumi tail Keroro as he sneaks down back alleys until they fall through a boarded hole in the ground to a large, alien shopping center (Alien Street) under ground. 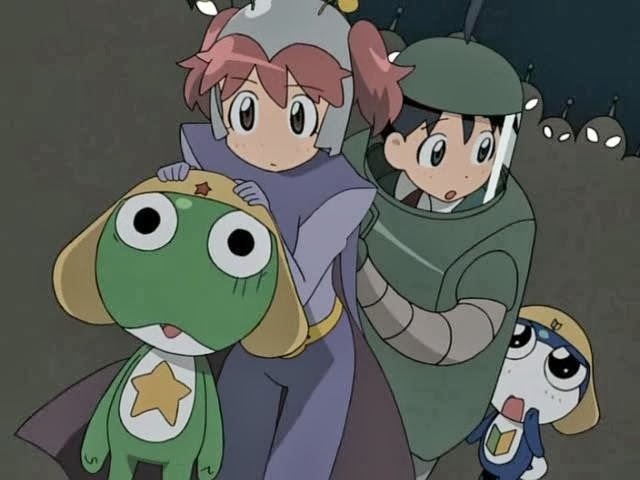 Police Officer Poyan-chan is about to take them in, since humans aren’t allowed, but Keroro and Tamama save the pair, saying they are Hysterics in disguise. After getting Fuyuki and Natsumi disguises, Natsumi eventually gets angry with Keroro, causing the Kamuran robot patrol to intervene since no fighting is allowed. 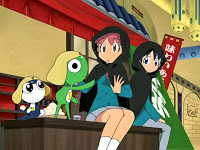 Natsumi wants to explore, but Keroro forbids it, causing another fight. They flee the robots to a concert recital, where Natsumi is soon outed as human. However, since she saved an alien’s life, she’s given a pass, though the injured Keroro is not happy. 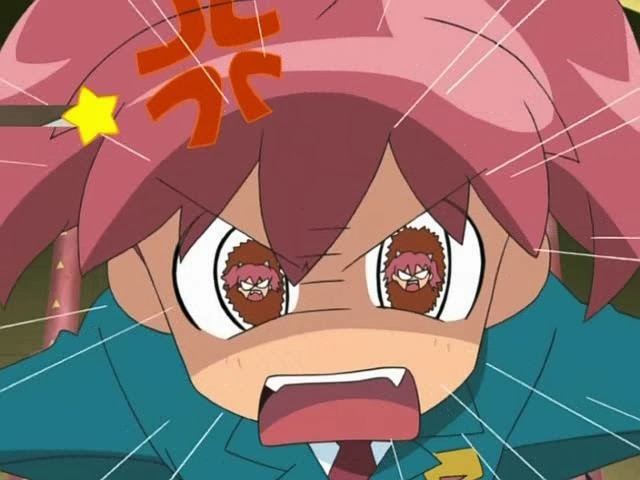 Giroro becomes unhappy when he learns Keroro was about to sell his weapon for Gunpla. 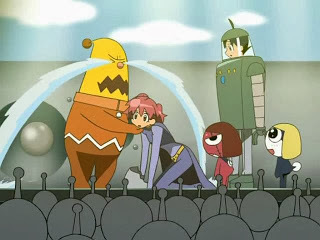 Giroro busts Keroro making Char’s Zaku Gunpla and Natsumi busts the pair of them. 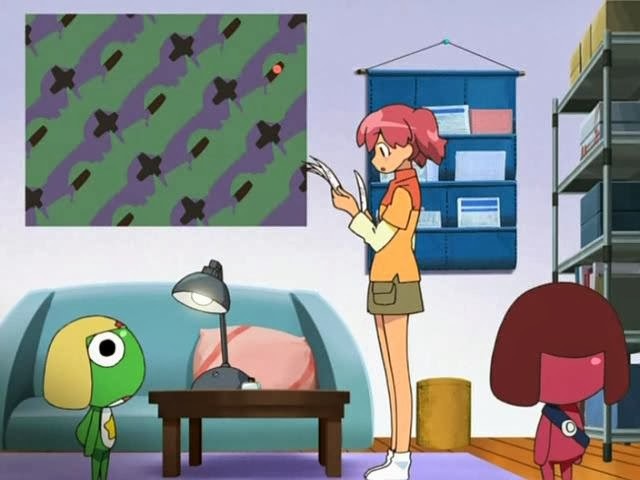 She discovers resume’s they’d made up years earlier showing Keroro’s Gundam interest, Mois “ojisama” interest, but nothing for Giroro. Keroro decides to use this to his advantage, twisting Natsumi’s words so that Giroro thinks he needs a hobby to win favor of Natsumi. Giroro fails at Gunpla, flower arranging, cookie making, and singing. When he consults with Mois, he gets angry at her interest in doing things for “ojisama” (Keroro). So he desperately tries to find an interest of his own, causing Keroro to be pleased at the thought of more leisure time. When Natsumi learns of his efforts, she tells him a hobby isn’t work and Giroro should just do what he wants. 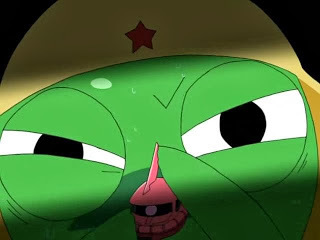 Since Giroro wants to invade Earth, that’s what he’s going to do. Another episode with two stories that were pretty fun. Beyond that, there was the usual amusement from Natsumi’s fights with Keroro, and her being forced to flee since fighting isn’t allowed. The second episode was heavy on the Gundam references, going well beyond the normal Gunpla models to actually talking about characters and even reciting one of Char’s speeches. It makes me glad I took the time to watch the original franchise (still have others in the franchise on my plate). I couldn’t help but giggle at Mois’s resume, which was all about “ojisama” (older male/uncle). Has Natsumi noted, this was very weird. So as I said, a couple of fun stories here. Since I’m actually enjoying myself, I’m going to keep pressing forward for now.